Home /Home/Nielsen will stay on as secretary until April 10, she said Sunday. Nielsen will stay on as secretary until April 10, she said Sunday. Department of Homeland Security Secretary Kirstjen Nielsen submitted her resignation to President Donald Trump Sunday. “Its been an honor of a lifetime to serve with the brave men and women of @DHSgov. I could not be prouder of and more humbled by their service, dedication, and commitment to keep our country safe from all threats and hazards,” Nielsen posted on Twitter, along with a copy of her resignation. 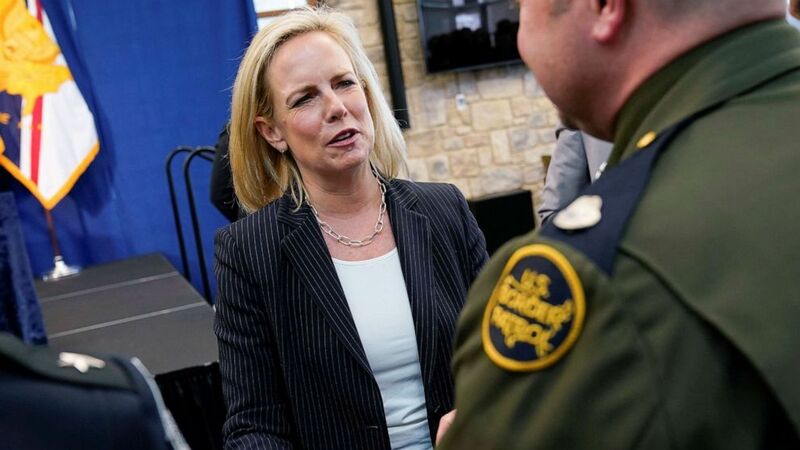 Nielsen will stay until April 10 “to assist with an orderly transition and ensure that key DHS missions are not impacted,” she stated on Twitter. Kevin McAleenan, the current U.S. Customs and Border Protection commissioner, will become the acting secretary for DHS, Trump announced on Twitter. (Joshua Roberts/Reuters) Secretary of Homeland Security Kirstjen Nielsen greets a member of the Border Patrol at the U.S. Customs and Border Protection Advanced Training Facility in Harpers Ferry, W.V., March 13, 2019. A veteran of the George W. Bush administration, Nielsen had been chief of staff to then-Homeland Security secretary John Kelly before he became Trump’s chief of staff at the White House. At the helm of DHS, Nielsen was a major player in implementing the administration’s highly controversial “zero-tolerance” policy that resulted in the separation of thousands of migrant children from their parents during the summer of 2018. Nielsen became the public face of the policy, and at one point, was targeted by protesters who heckled from a few feet away while she dined at a Mexican restaurant in Washington, D.C.
“To a select few in the media, Congress and the advocacy community, I’d like to start with a message for you: this department will no longer stand by and watch you attack law enforcement for enforcing the laws passed by Congress,” Nielsen said in June 2018, defending the policy while speaking to the National Sheriffs’ Association in New Orleans. Known as a cybersecurity policy wonk, Nielsen saw Homeland Security through a successful 2018 midterm elections amid concerns over cyber attacks. She had repeatedly said Russia was to blame for meddling in the 2016 presidential elections while not explicitly supporting special counsel Robert Mueller’s investigation into Russian interference. Trump nominated Nielsen to be DHS secretary in October 2017. She was sworn in as DHS secretary in December 2017. Democrats and Republicans had differing reactions to Nielsen’s resignation. “It is deeply alarming that the Trump Administration official who put children in cages is reportedly resigning because she is not extreme enough for the White House’s liking,” House Speaker Nancy Pelosi said in a statement.